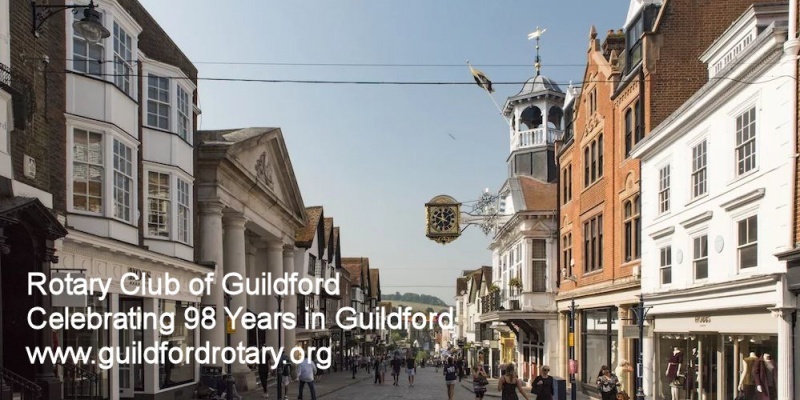 Welcome to the Rotary Club of Guildford. 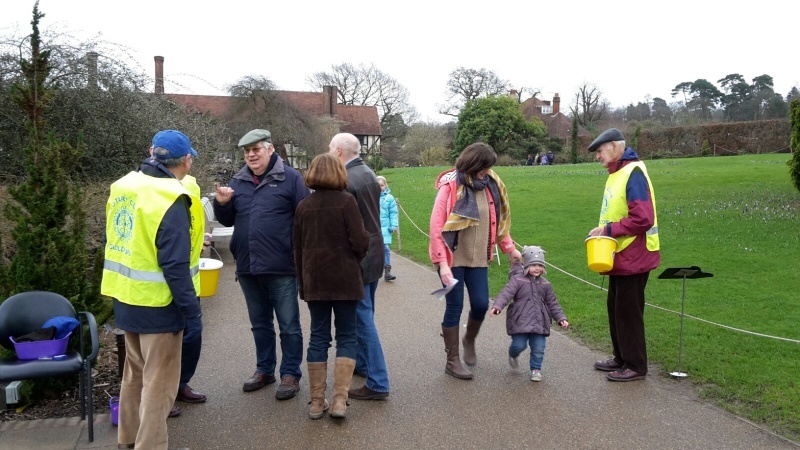 RHS Wisley opens its doors once again to Guildford Rotary Clubs to collect for the fight against polio. Rotarians from Kolkata(Calcutta) India, have sponsored, through The Rotary Club of Guildford, a 'Rotary Foundation Matching Grant Project' enabling the gifting of two pieces of equipment to assist the mobility of those affected by Multiple Sclerosis. This club, number 48 in Britain and Ireland, was founded in 1921. We are a member of District 1145. 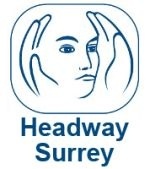 Cognitive rehabilitation, support and services for those affected by brain injury across the county of Surrey. Based in Guildford, Vaughan House offers supported housing to those who are single, homeless or at risk of homelessness. 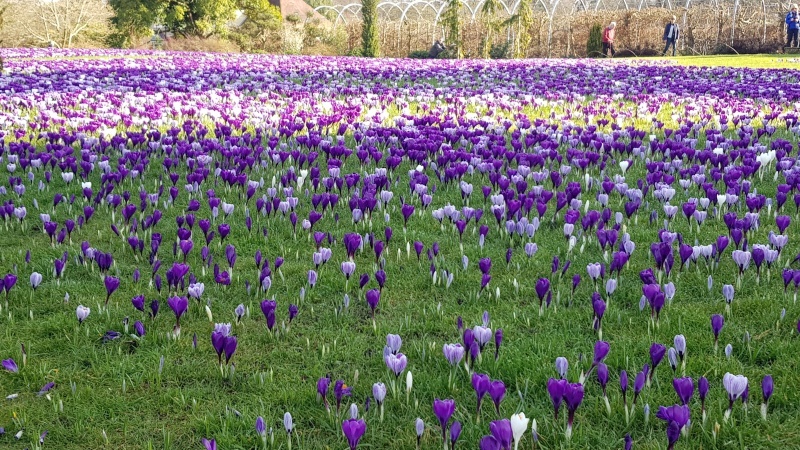 RHS Wisley opened its doors once again this 1/2 term week Feb 2019 to Guildford Rotary Clubs to collect for the fight against polio. 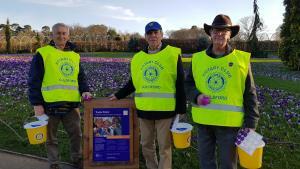 For voluntary donations 'Purple 4 Polio' wristbands are handed out and children can, if they wished, have a "Purple Pinkie" to simulate the finger markers given to children taking part in the Polio vaccination programme promoted and funded by Rotary International. "Purple Pinkie" is a campaign by Rotary to raise money to End Polio Now – one of the world’s biggest ever immunisation programmes. In its first year it was a tremendous success capturing the imagination of the public and to build on that success, "Purple Pinkie" is coming up with many more innovative ideas - full of fun - with something for all ages. 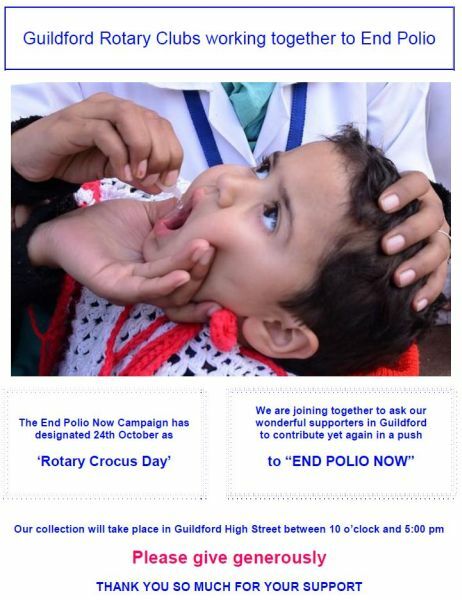 Polio has no cure. It is a crippling and potentially fatal disease and children under the age of five are at greatest risk. However Polio is easy to prevent by vaccination that costs just 50p. When a child is vaccinated, they have a purple stamp put on their little finger – giving them a "Purple Pinkie." 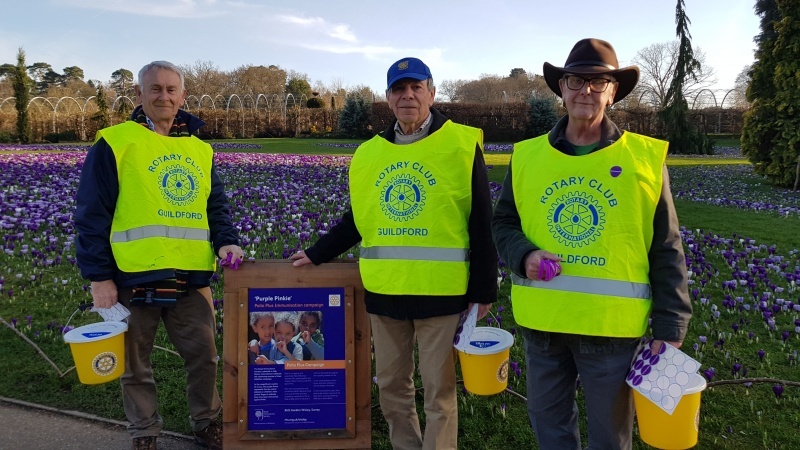 In 1985 Guildford Rotary Member, Dr Clive Addis-Jones, helped to set up the Rotary Jaipur Limb Project, and was the Founder Chairman when it became a registered charity in 1993. The Rotary Jaipur Limb project is a pro-active fund-raising and project-initiating body of Rotarians, drawn from all over RIBI (the Rotary International region covering Britain and Ireland). It was formed in 1985 and became a registered charity in 1995. There are 9 trustees, assisted by several co-opted managers, who divide their time between raising awareness of the project among Rotarians in RIBI, identifying appropriate sites for projects, principally in India and Africa, and assisting in the preparation of programmes, budgets and financing for those projects. 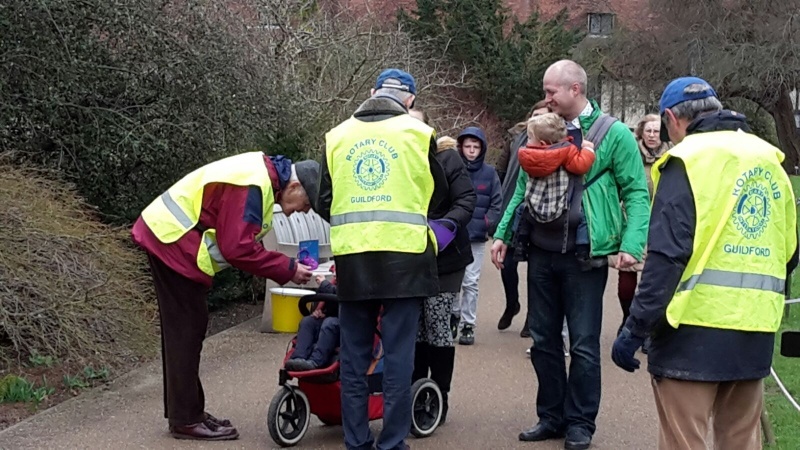 The Rotary Club of Guildford feels privileged to count Clive among its membership and warmly congratulates him on the honour bestowed upon him. Rotarians ï¿½ men and women alike ï¿½ volunteer their efforts to improve the quality of life in their own communities and beyond their communities' borders. The world's Rotary clubs meet weekly and are non-political, non-religious, and open to all cultures, races, and creeds. Club membership represents a cross-section of local business and professional leaders. 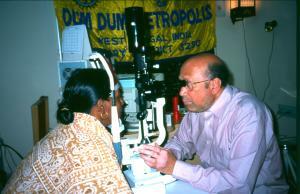 The main objective of Rotary is service ï¿½ in the community and the world. We build goodwill and peace, provide humanitarian service, and encourage high ethical standards in all vocations. The Rotary motto is "Service Above Self"
60,000 members in Great Britain & Ireland in 1800 clubs. Service Programme (Community, Youth, International): Mike Wills, Grant Connell. Events: Sue Lawson and Emma Valler. Website and Social Media: Chris Shorter. Cllr Mike Parsons will entertain. We meet on Mondays at 12:45.